The dentist plays a vitally important part in maintaining overall health, which is why it is so important to make dental care a strong priority. In children, a dentist is concerned with maintain overall health while fostering an environment where growth and development are allowed to move forward. It is ideal to have your child’s first experience to be a comfortable and enjoyable experience, which is why it is best to start your child’s path to dental health early. Having your child’s first visit be due to a toothache or infection adds stress to any visit, and could impact your child’s first impressions of what dental care is about. Early dental checkups make it easier to build a good rapport with your child to establish a foundation of trust and comfort for future visits. Dr. Trotti believes that the foundation of ideal oral health in children starts with education. Many children show some feelings of apprehension in coming to the dental office, which is why we make every effort to make the first visit more of “get-to-know-you” session. When they feel comfortable, they are more apt to hear what the dentist has to say, and see the dental office as a place they look forward to going rather than somewhere they would rather avoid. At your child’s first appointment, you will see a lot of “show-and –tell”: your child will get to see first-hand how the chair moves, how the “magic wand” blows air and water with the press of a button, and how the “magic toothbrush” helps make teeth shiny and clean. 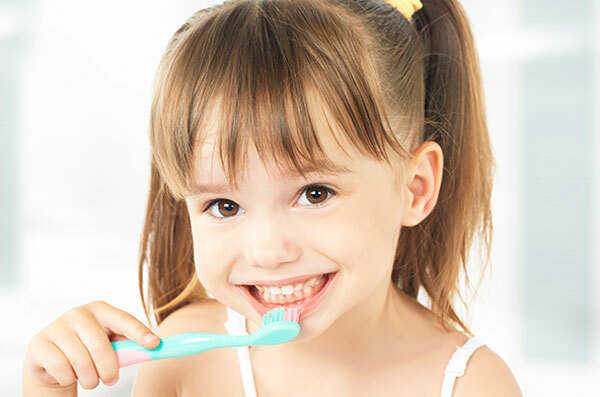 In the first visit, your child will also help to count their teeth and will learn how to brush their teeth properly, all while your child sees first-hand what is going on while they are holding their own mirror. At the end of their visit, your child will get to visit Dr. Trotti’s treasure box, where they will be able to pick their own souvenir toy, which will help them fondly remember the first time they came to Albion Dental Office, marking the first moment in a wonderful and life-long relationship with the dentist!